Your eyes might wander from the screen. 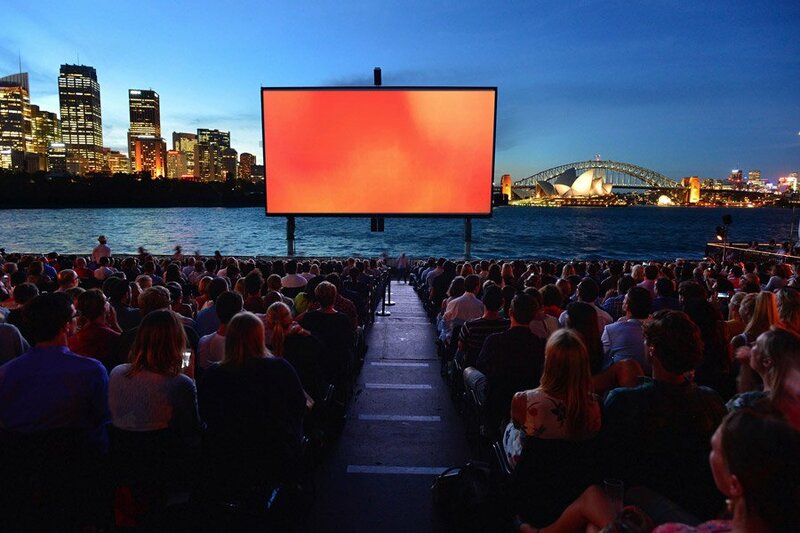 Photo courtesy of St. George Open Air Cinema. In a leafy park in Sydney, Fathom assistant editor Berit Baugher stops to smell the handmade pizza. And stays for the jumbo movie screen. SYDNEY – An early evening stroll through the Royal Botanic Gardens lead me to one of my favorite Sydney experiences. The OpenAir Cinema was on my list of things to do, but I hadn't put effort into mapping directions to the venue or pre-ordering tickets. I resigned myself to the fact that I'd never get to it, and the cinema left my mind — until I found myself walking along the fragrant path to Mrs. Macquaries Chair. I had been traveling solo for two weeks at this point and was in the mood for something familiar. I was with my mother the last time I visited Sydney, and I vividly remember sitting on a sandstone bench named for the wife of one of the city's earliest governors. It was said that Lady Macquarie sat on the rocks looking for ships as they entered the harbor. One can't blame her for spending so much time watching the sea, as the view is pretty spectacular. I continued on the path to Mrs. Macquaries chair and suddenly came upon a crowd walking toward the entrance of the OpenAir Cinema. Before I knew it, one hand was holding a ticket for Red Dog and the other was holding a phone up to my ear to cancel dinner reservations. I felt pretty lucky — seats often sell out before the show date, but a few tickets are released at the door before each screening. I was pleasantly surprised by the food offerings. Quite the opposite from normal theater fare: handmade pizzas, Japanese curry udon noodles, homemade ice-cream sandwiches from local favorite Pat & Stick's (the peppermint choc chip is incredible), coffee from Latteria Café. Prices made me wince (the wagyu burgers were going for $20AU), but I suppose in addition to good quality food you are also paying for the views. The whole thing was very civilized. Once the sun began to set, the crowd settled into stadium-style seating. Although harmless, the garden's resident fruit bats made their presence known throughout the movie by occasionally flying in front of the screen or letting out a shrill squeal. Here's a tip — avoid sitting in the back seats under the trees or you'll inadvertently set yourself up as a target for bat droppings. I didn't make it to Mrs. Macquaries Chair, but I found something I liked even better. With the sun gone, the huge movie screen glowed against the dark sky. And the Opera House and Harbour Bridge illuminated the city behind it — a magical image and a perfect summer night in Sydney.